Many of our members are online. This is a list of sites for all of our members who maintain one. It is not a complete list of all members. Carol Amato - Carol has written several books on a variety of subjects, both fact and fiction. You can find more at her website: www.caroljamato.com. Sherry Barber - Sherry writes articles for regional and national publications, plus filler for regional, national and international publications. Tongue in Cheek documented her cancer surgery with warmth and humor. Hong-My Basrai - Hong-My is seeking a publisher for her account of her escape from Vietnam and her struggle to build a new life. Read more here: Behind the Red Curtain, a Memoir. Kimberly Davis - You can read Kimberly's occasional posts on the club blog under the heading: The Snark's Bite. Forces that Shape our Lives. Jackie Fisher - Jackie writes books for kids. Find her on Goodreads. Click here to buy her newest YA novel Courage Found. Nickolae Gerstner - Nicki has written a historical novel and several mysteries. Here she is: Nickolae Gerstner, Author. Kathleen Harrington - Kathy writes romance novels and historical fiction. Keep up with her on her author page at Goodreads. Hratch Israelian - Hratch is workshopping an epic poem, Bread and Wine, a morality tale you can experience from the level of your soul. You can find a short version at israelian.myfreesites.net. Hilda Lassalette - Hilda began writing children's books but has recently switched to romance. Find her site on Smashwords. Blythe Leszkay - Blythe is a lawyer. Her website is a resource for writers of crime and legal fiction and nonfiction: Criminal Law Consulting. Michelle Majors - Michelle blogs on Tumblr: Tales from The City of Angels. Kay Murdy - Kay writes on religion and has published a novel, Song of the Dove, about the life of Mary. Check out her site: Together with God's Word. Cassy Muronaka - Cassy is a former newspaper photographer, reporter, and editor. She has freelanced for many magazines. You can find her at her website, www.cassymuronaka.com. Angela Myron - Angela writes upper middle-grade fantasies. You can find her at AngelaMyron.com. Sherry Novak - Sherry has two novels in progress., and she blogs for the WCW. The Unfolding of Wings. Helen Oyakawa - Helen's second novel for young adults, Not Paradise but Close Enough, was published in August of 2015. Cindi Peterson - Cindi blogs here: Joie de Vivre. Fran Syverson - Fran has written for the Sierra Madre Weekly. Articles from her column InnerViews have been collected in a book of reminiscences and meanderings. She is also a frequent contributor to Beacon Media in Sierra Madre. Read more on her site, InnerViews. Mary Terzian - Mary has recently published her second memoir, Politically Homeless. You can find her books and more on her site: www.authorsden.com/maryterzian. Robin Axworthy - You can read samples of her work online at Cadence Collective. David Bortin - You can read some of his work in The San Gabriel Valley Poetry Quarterly. Claire Koehler - You can read a sample of Claire's poetry on her site, Remnants of Time. Julie Larson - You can read a sample of her work in The San Gabriel Valley Poetry Quarterly. Denise Walsh - You can read a sample of her work in The San Gabriel Valley Poetry Quarterly. 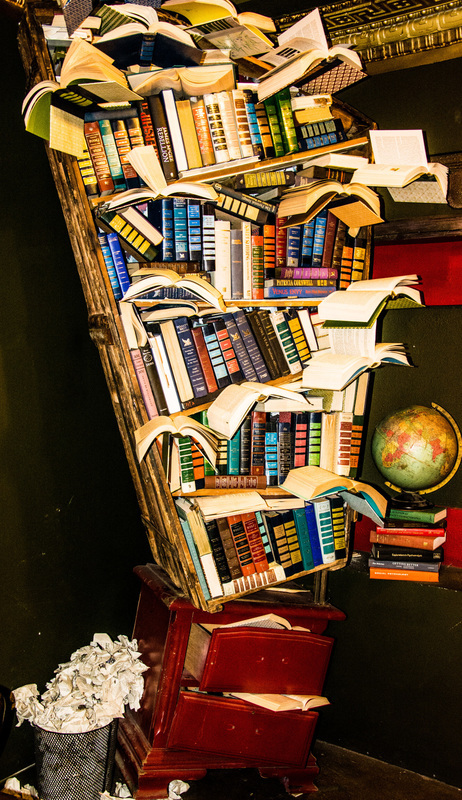 Art installation by Jena Priebe and David Lovejoy at The Last Bookstore in Los Angeles. Photo by Michelle Majors, WCW member. You can see more of her photos on Tumblr. ...or meet us in person.